Springview House is an 18th century residence set on a working Dairy and Angus Beef farm. We have been welcoming guests into our home since 1992. I love cooking and guests can be assured of some delicious home-baking on their visit. I am delighted to say that past guests have commented on how at home they feel at Springview House. I like to ensure that everyone who steps over the threshold of my home enjoys a true Irish experience. A beautiful 19th century home with charming period touches, Springview House bed and breakfast is situated on a mixed working farm in pictorial County Kilkenny. Sitting halfway between medieval Kilkenny city and the renowned Rock of Cashel, guests are superbly located to tour the renowned South East. The area is ideal for those looking to take on the landscape with scenic hiking trails, golf and fishing nearby. With complimentary tea/coffee and delicious home baking on arrival, guests will enjoy a real Irish welcome. 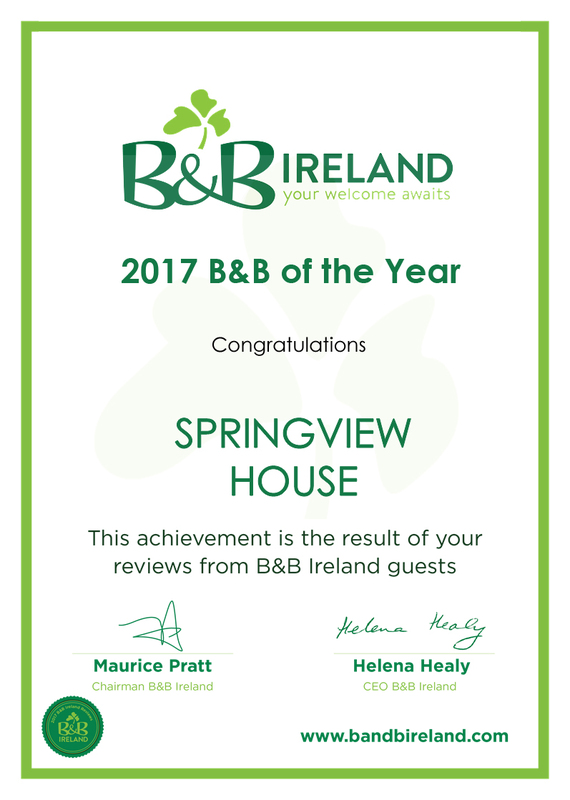 Winner of B&B of the Year 2017. Take exit 4 for Kilkenny R693 off the M8. Take R693, Kilkenny Road on approach to Urlingford N8. From Kilkenny take Cashel/Urlingford R693 for approximately 20km. We were warmly greeted and treated to delicious scones and hot tea. It was a real treat. Breakfast was amazing. This place was amazing and so nice. We were greeted with biscuits and tea and a smile. He accommodations were lovely. The breakfast was amazing! If we could adopt Eileen as our "Irish Mum", we would. She was a delight! The property is beautiful and the rooms are big. We arrived to coffee and amazing treats. You can tell Eileen loves to do this and loves meeting new people. Breakfast was amazing. So much food and she packed us snacks to go. Definitely a highlight of the trip was staying here! Wish we had stayed more nights! They were the nicest host we have ever met, beautiful home and such loving and caring people. We definitely will be back and spend more time at that home! Eileen and her B&B were simply delightful! One of the highlights of our first trip to Ireland. We will definitely return! Devil's Bit Loop: is a 5km marked loop walk that utilises forest and hillside paths to provide a pleasant and rewarding hill walk. At the summit of Devil’s Bit Mountain you have views of 8 surrounding counties! Devil's Bit is 38km from Springview House and is a lovely way to spend a day. After a day out and about sightseeing, you can look forward to a warm welcome on your return to our comfy home. Kilkenny City: is 27km from Springview House and is a treasure trove of historic buildings and landmarks including Kilkenny Castle. There is lots to see and do in Kilkenny City for all the family to enjoy. Rock of Cashel: is one of the most spectacular tourist attractions in Ireland and one of the most visited. A spectacular group of Medieval buildings set on an outcrop of limestone in the Golden Vale. The Rock of Cashel is 34km from Springview House.